A non-reward attractor theory of depression, in which the lateral orbitofrontal cortex attractor network system for non-reward maintains its activity for too long; and the medial orbitofrontal cortex reward system is less responsive (559, 572, 579, B12, B13, B14). 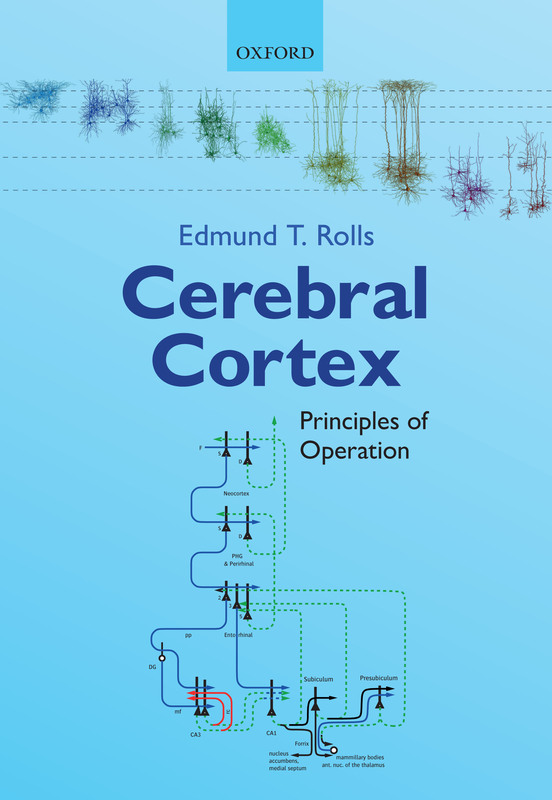 The theory is supported by a model of the computation of non-reward in the orbitofrontal cortex (562). An introduction to the theory is available as a lecture. The lateral orbitofrontal in depression has increased functional connectivity (564, 591, B14) with the precuneus (where the self is represented, and which may contribute to the low self-esteem in depression) (592); with the angular gyrus (involved in language, and which may contribute by a long loop attractor to the negative rumination in depression); and with the temporal lobe cortex (which may contribute to the sad interpretation of faces and events) (564). Effective or directed connectivity from the medial orbitofrontal cortex to the lateral orbitofrontal cortex is increased in depression, and given that the activity in these areas is reciprocally related, this may release the lateral orbitofrontal cortex into high activity, which was found in the analysis (583). The theory of depression (559, B13, B14) is also supported by increased functional connectivity of the non-reward-related lateral orbitofrontal cortex with the posterior cingulate cortex (588) which provides a dorsal route into the hippocampal memory system (584), and decreased functional connectivity of the reward-related medial orbitofrontal cortex with the parahippocampal gyrus (564) which provides a ventral route into the hippocampal memory system, with both effects enhancing sad and reducing happy memories in depression. 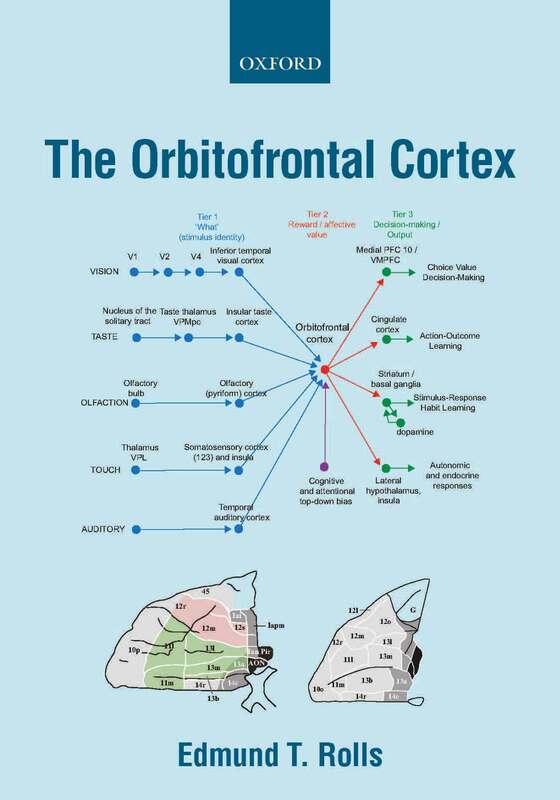 A pregenual / subcallosal subdivision of the anterior cingulate cortex normally with high connectivity to the medial orbitofrontal cortex reward system has increased functional connectivity with the lateral orbitofrontal cortex non-reward system in depression. This may provide a mechanism for more non-reward information to be transmited the reward-related part of the anterior cingulate cortex, contributing to depression (596). The amygdala has reduced functional connectivity in depression (590). 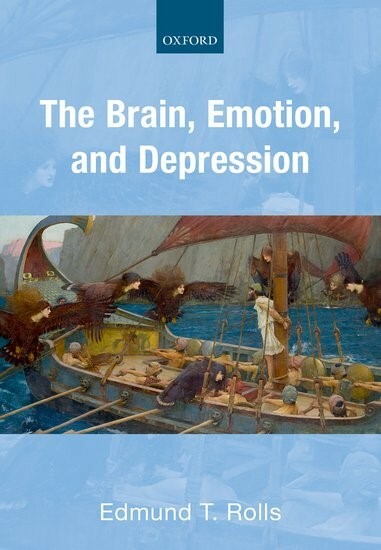 An overview of the brain mechanisms of depression, and how this fits in with understanding of the brain mechanisms of emotion, is provided in The Brain, Emotion, and Depression (B13). A theory of schizophrenia in which reduced glutamate functionality in the prefrontal cortex destabilizes attractor networks producing cognitive impairments in attention, and exceutive function; and in which reduced glutamate function in the orbitofrontal cortex leads to the negative symptoms. Increased activity in medial temporal lobe networks overstabilizes attractor networks there leading to the positive symptoms including hallucinations and delusions (450, 490, 496, 503, B12). The discovery in a sample of 2,567 patients with schizophrenia that the main variation between individuals is in the negative symptoms, using the PANSS (580). This has implications for stratified treatment. In first-episode patients with schizophrenia the main changes in functional connectivity involve the inferior frontal gyrus; and become established in thalamic connectivity in the chronic state (563). 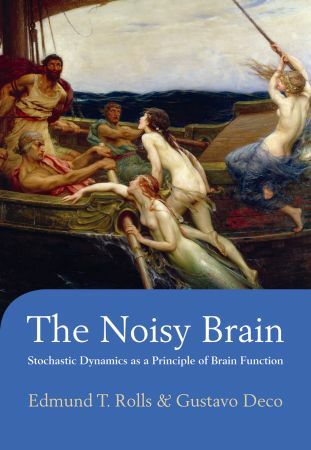 Increased functional connectivity of the precuneus and posterior cingulate cortex is related to volition (thought control), and is not treated by neuroleptic drugs (538). A middle temporal gyrus / superior temporal sulcus (STS) region involved in face expression processing and theory of mind has reduced cortical functional connectivity with the ventromedial prefrontal cortex which is implicated in emotion and social communication. The precuneus, which is implicated in spatial functions including of oneself, has reduced functional connectivity. 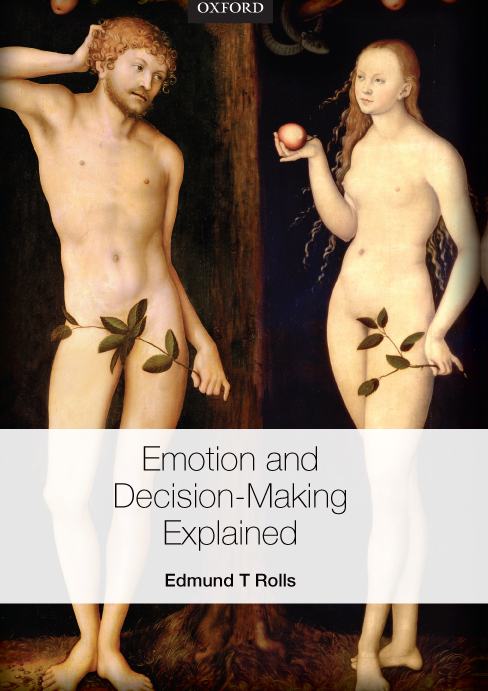 These two types of functionality, face expression-related, and of one’s self and the environment, are important components of the computations involved in theory of mind, whether of oneself or of others, and the reduced connectivity within and between these regions makes a contribution to the symptoms of autism (541, 570). A theory that hyperglutamergia in the prefrontal and premotor cortices in OCD overstablizes attractor networks in these regions (449, B14). Impairments in the rapid reversal of associations between stimuli and reward value in patients with selective lesions of the orbitofrontal cortex and related areas and their relation to emotional changes (188, 203, 331, 354, B14). Also, impairments in impulsivity (353, 362, 394). These discoveries were inspired by the discoveries on neuronal activity in the orbitofrontal cortex, and are relevant to understanding the changes in patients with frontal lobe damage and in patients with borderline personality disorder. The medial orbitofrontal cortex reward system has high functional connectivity in those who tend to drink alcohol and who are sensation-seekers and impulsive; and the lateral orbitofrontal cortex non-reward system has low functional connectivity in those who tend to smoke, and are impulsive for a different reason (599). The medial orbitofrontal is also activated by amphetamine (367). These discoveries underline the different neural bases for different types of addiction (B14).